I enjoyed a really wonderful Saturday afternoon today! 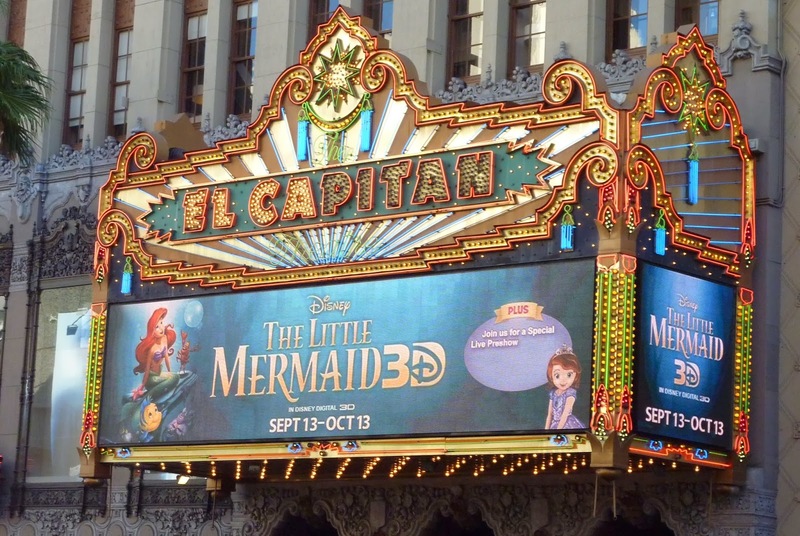 I met my oldest daughter and my friend Lindsay at a screening of THE LITTLE MERMAID (1989), currently playing in 3-D at the El Capitan Theatre on Hollywood Boulevard. The theater was absolutely packed for this screening, so we sat in the El Capitan balcony for the first time. Although I generally prefer audiences which are a bit quieter, I really enjoy seeing Disney movies at the El Capitan because the young children in attendance are so completely thrilled and awestruck by the experience. There were audible gasps when Ariel came out on stage live at the end of the movie; the children's excitement at seeing her, as they shouted answers to her questions, was adorable. Hopefully today's experience will be a treasured moviegoing memory for many of the children who were present. 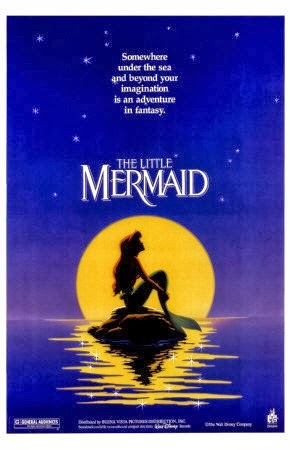 THE LITTLE MERMAID has been special to me since it was first released; along with BEAUTY AND THE BEAST (1991) it's my favorite film from Disney's "Second Golden Age of Animation." Aside from my love for the movie itself, I have many happy memories of enjoying the movie with my children, including taking my younger daughter to see it as her very first "theater movie" when it was reissued a decade or so after its original release. There's probably not much that needs to be said about the film's storyline, as it's a movie so many people have seen over the last 24 years. The thing I love most about THE LITTLE MERMAID is its brilliant score by Alan Menken and the late Howard Ashman. "Part of Your World" probably triggers more emotion in me than any other Disney music, excepting perhaps the score for MARY POPPINS (1964). Having seen Menken in concert in August 2012 and again at this summer's Disney Expo, and hearing his personal stories behind the score, made seeing the film again for the first time in years all the more meaningful. "Under the Sea" is also especially brilliant, a colorful, clever showstopper akin to "Be Our Guest" in BEAUTY AND THE BEAST; lyrics such as "hot crustacean band" never fail to crack me up. I marvel at the creative minds behind a movie like this; who dreams up a composer-conductor who's a Jamaican crab? Some of the movie's visuals are also quite stunning. In addition to "Under the Sea," some of the most memorable, timeless moments are shots of Ariel emerging from the sea. I also especially love the ending, which is beautifully scored and never fails to induce happy tears. I tend to react emotionally to things which are beautiful and joyous, and THE LITTLE MERMAID is that for me, and then some. 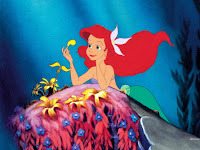 The movie has a fine voice cast, particularly Jodi Benson in the title role as Ariel. Pat Carroll, Christopher Daniel Barnes, Samuel E. Wright, Buddy Hackett, Rene Auberjonois, and Edie McClurg are some of the lead voice actors. This was the last film of Ben Wright, who might be most familiar to audiences as mean Herr Zeller in THE SOUND OF MUSIC (1965). Way down in the voice actor list other interesting names can be found, including Anne Lockhart (daughter of June), Nancy Cartwright (THE SIMPSONS), and Edie Lehmann (an '80s GENERAL HOSPITAL star who switched to voice acting and background singing). THE LITTLE MERMAID was directed by Ron Clements and John Musker. It runs 83 minutes. 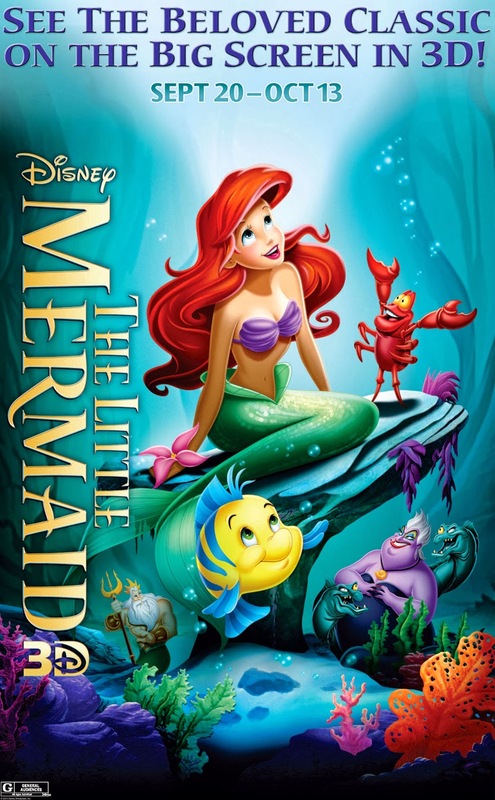 THE LITTLE MERMAID has been released in multiple formats over the years, starting with a VHS release. DVDs have included a 2-Disc Platinum Edition and a brand-new Blu-ray/DVD combo Diamond Edition. Pictured at the left: It wouldn't be a movie at the El Capitan without the pre-film confetti blast! Previously: Tonight's Movie: Lady and the Tramp (1955) at the El Capitan Theatre; Tonight's Movie: Cinderella (1950) at the El Capitan Theatre; Tonight's Movie: Peter Pan (1953) at the El Capitan Theatre, and Tonight's Movie: Mulan (1998) at the El Capitan Theatre. Friday evening "The Little Mermaid" was screened at my daughter's college for the animation students. A chance for the generation of kids who grew up with the film to see it through scholarly eyes. I told her how starved audiences were for a really first-rate animated feature when "The Little Mermaid" was released. At least, that's how I felt attending the movie with a friend and her daughter. I remember the audience breaking into spontaneous applause at the end of "Under the Sea". Movie moments to remember. Loved hearing about your daughter's experience looking at the movie in a new way, that's great. So true what you wrote about what it was like when LITTLE MERMAID was first released. If you haven't already seen it, you might be interested in the documentary WAKING SLEEPING BEAUTY which tells a little of the story of Disney "waking up" and bringing back great animation. Laura - The Little Mermaid is my ALL-TIME FAVORITE DISNEY MOVIE. I love that movie so much. I saw it in the theaters when it first came out. It's one of the first VHS tape my parents ever purchased for me. I had the one with the controversial cover. And when I was a pre-teen, I watched this film 7 times in a row in one day just to see if I could. Ha. So this comment is just to express my love for this movie and my jealousy of your experience at El Capitan. I wish I was there with you. Would have been a wonderful experience. I loved hearing of your personal connections withe THE LITTLE MERMAID, Raquel, and how much you love it. Wonderful memories! I hope the TCM Festival will utilize the El Capitan again next year and maybe even show some more Disney movies there. It's a grand place to enjoy a movie. Wish you could have joined us!